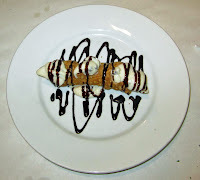 We had dinner on a recent Sunday late afternoon at Tutto Bene in Lake Mary. We were pleasantly surprised and had a much better meal than I've had recently at another nearby Italian Restaurant, by far. Tutto Bene is located very close to the Seminole State College Campus and, judging from some of the items on the menu board, I'd guess they cater to a nice College population as well as the area. We were hungry and adventurous, and sure brought our appetites with us! We started with appetizers. First there were Garlic Knots (not pictured). They were very garlicy, something my friend Tommy does not like. But I liked them, though i found them just a bit heavy. The marinara to go-with was very good. 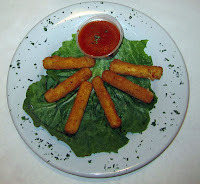 Then we had Fried Mozzarella Sticks. They were served with the same marinara which was fine with me as I really liked it. 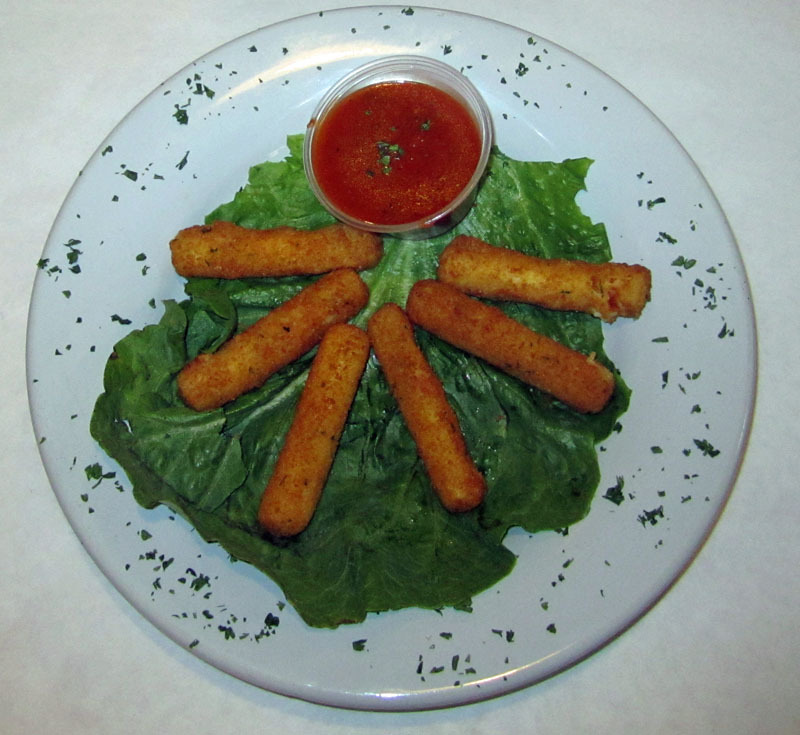 The mozzarella sticks could have been friend just another 30s seconds or so, they would have been better. Still, they were plenty good. 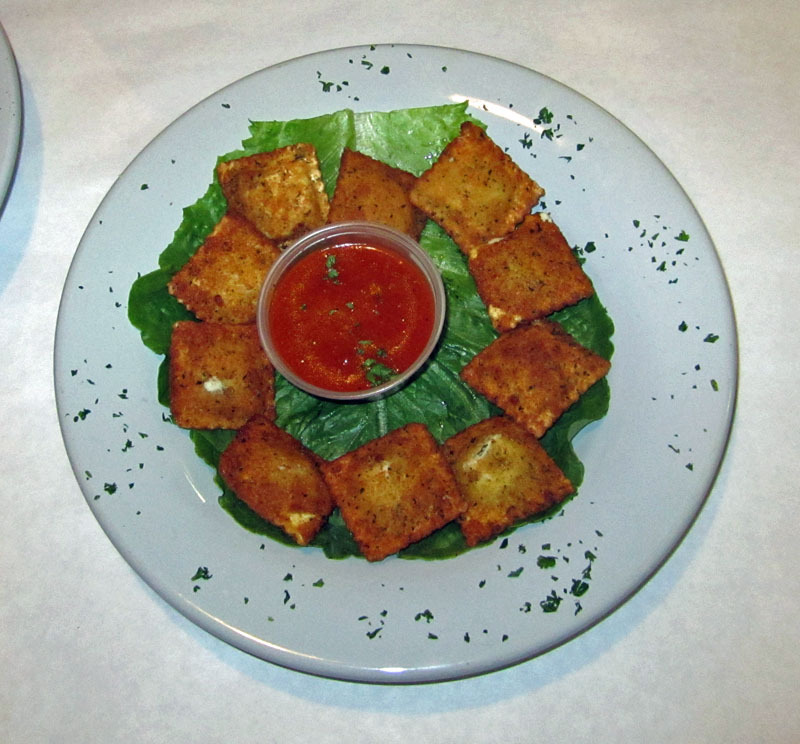 On top of that, we also ordered the Fried Ravioli. Again, they were very good, not overcooked, jsut right. And again, served with the same marinara--still just as delicious. These were pretty darned good. For my main course I had the Penne ala Vodka with Chicken. Wow, this was very good. You could tell that this dish was cooked to marry the flavors, and it had a lot of very good flavor. I liked it a lot. 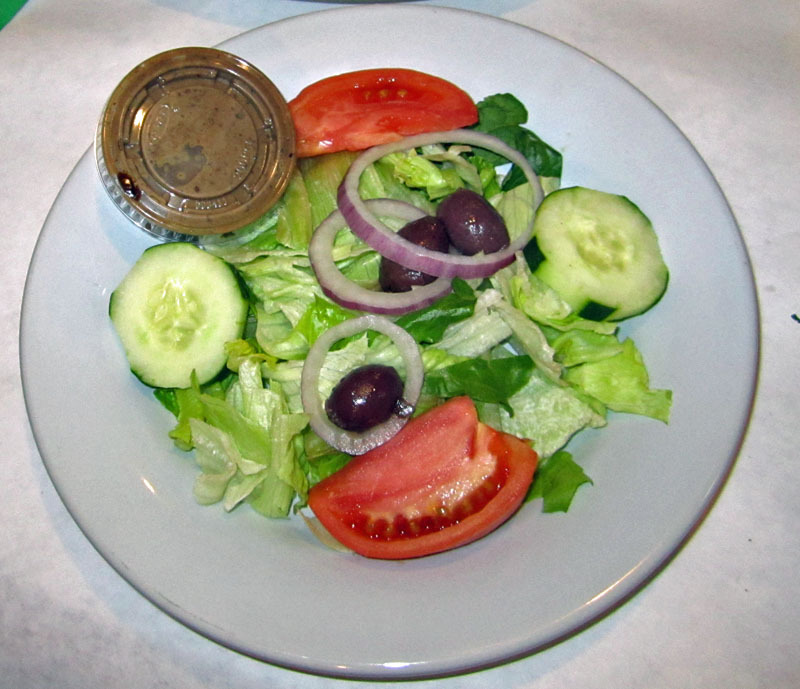 I also ordered a side salad, which our waitress almost forgot, but it had it right after my entree arrived. It was a good salad, nice and fresh. The best part of it was the dressing, a house Italian. It was very good and full of nice flavor. 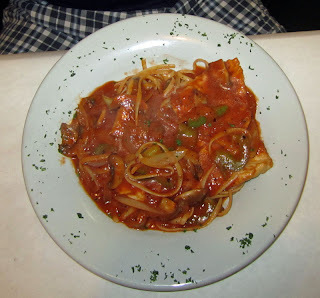 For his dinner, my friend Tommy had the Chicken Cacciatore. It, too was very good, and a nice portion. 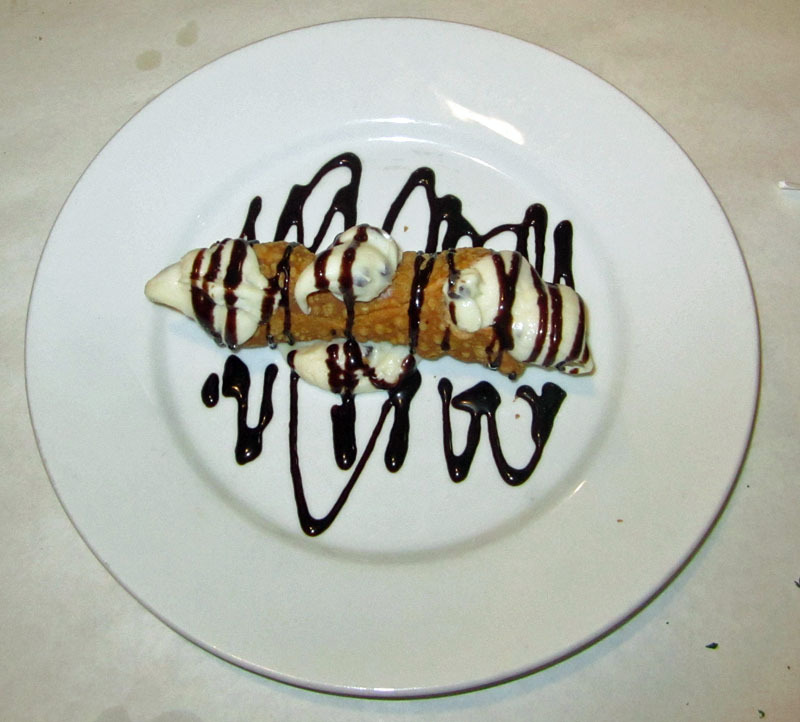 Finally, we ordered a Cannoli. All I can say is "yumm." It was very sweet but also very good. However, the chocolate sauce it was trimmed with did taste like bottled stuff from the store. Still it was good. We had a nice experience and dinner here. I'd come back. They have a nice menu and the wine and beer prices are very reasonable as well. 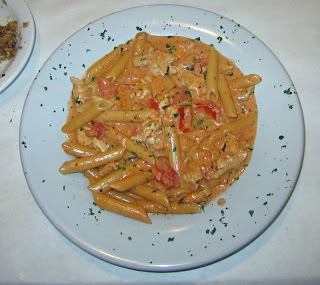 I had lunch recently at Romano's Macaroni Grill with some coworkers. It was a pretty decent lunch and a fair price. There were five of us, each with coupons. Our server handled it well without even batting an eyelid. I ordered the "choose three" for $10. The items I chose were (1) a Fresh Greens salad with Italian dressing, (2) the Whole Wheat Fettucinne Pasta, and (3) a half Roasted Turkey Sandwich. You can see above what I was first served, two of the three elements of my dish. I thought that a bit odd. The Salad and the half Sandwich arrived but you can see there is an open space. However, within a minute or two a manager arrived with the missing element, the Whole Wheat Fettucini, below. My guess is that there was some miscommunication in the kitchen or with the waitress, but it all eventually arrive. The salad was nice and fresh and tasty. The sandwich was good, though maybe just a bit dry--it could have used a touch of may or something. The past was very good with crisp broccolini and cherry tomatoes. The sauce for the fettucine was a bit thin--actually very thin, but the dish was tasty. Overall, this was a nice meal at a good price. 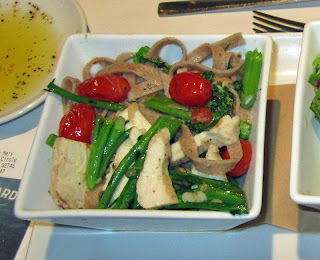 We recently ate at Bananas Modern American Diner on a Sunday afternoon. It was the weekend before Halloween and the wait staff were somewhat costumed up for that. But we had a decent meal here, though the service was a bit slow. Nonetheless, the food was generally pretty good and I'd eat here again. Bananas is a diner, and it does have somewhat of that type of look and feel. We were promptly greeted and initially shown a seat by the window, in the sun. But when we asked, we were shown a nearby booth which seemed better than sitting in the hot Florida sun, even if it was a nice autumn day. Upon ordering drinks, we also chose to get an appetizer of the Beer Battered Onion Rings. 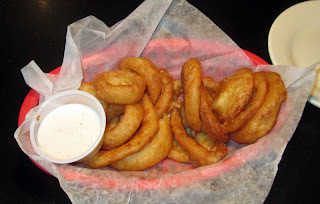 They were done nearly perfectly, nice, thick slices of onions in a tasty beer batter and fried just right. But the star of the dish was actually the horseradish dijon dipping sauce--it added just the perfect amount of zing to these nearly perfectly cooked onion rings. This was a real hit. For his meal, my friend Tommy had the Daddy's Burger with fries. 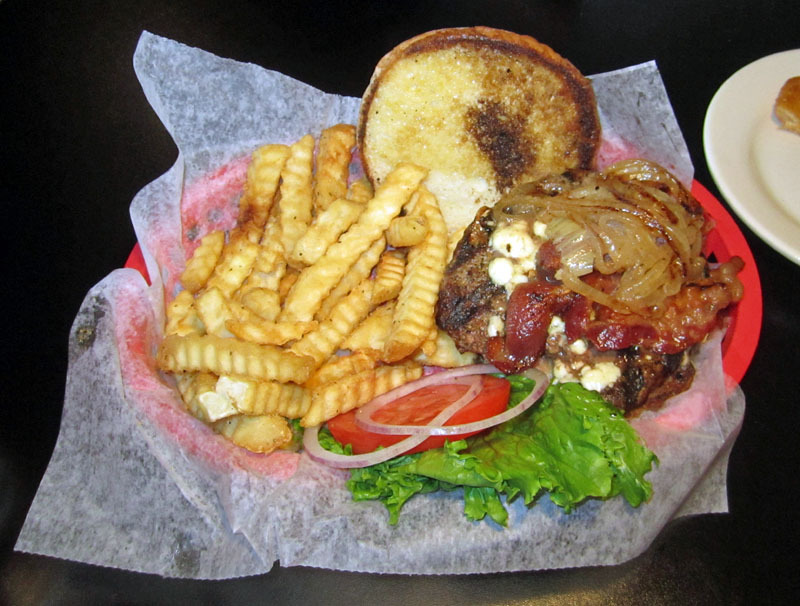 A burger was cooked and trimmed with blue cheese, smoky bacon, and caramelize onions. Lettuce, tomato, and onion were on the side. The bun was nicely toasted as well. Tommy ordered the burger medium, but it came out well. Our server did offer to replace it, but he ate it. It was still rather tasty, just a bit overcooked. The fries were very ordinary, however, and a bit on the starchy side, if you ask me. But the burger was plenty good. For my meal, I ordered the Buffalo Burger with a chicken breast for the meat. 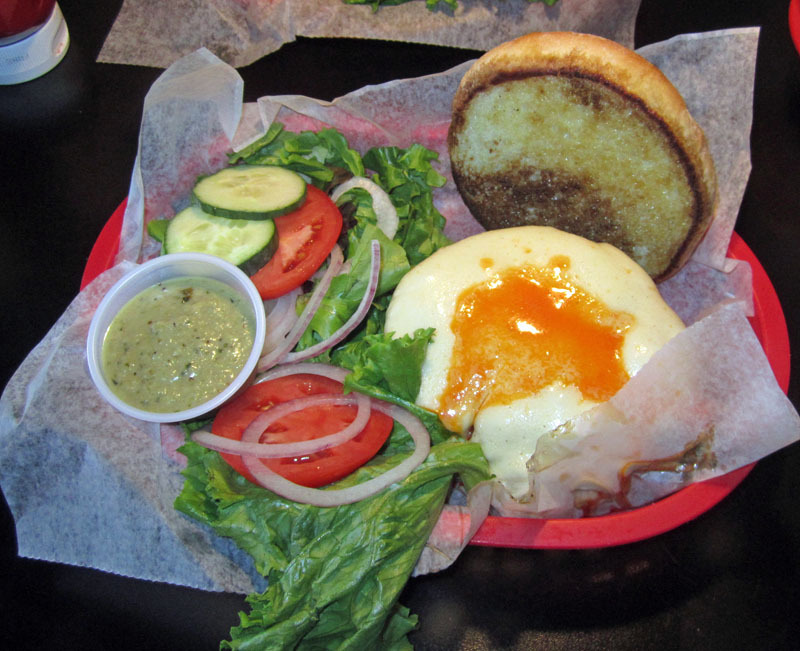 A chicken breast was served on a toasted bun with provolone cheese and a spicy buffalo wing sauce. The portion of buffalo, sauce, though tasty, was very skimpy, as you can see in the picture. There was not much of it. The chicken breast was cooked through, and just barely. Instead of the fries, I asked for and got a side salad. It was served with a truly amazing Wasabi Viniagrette that was out of this world. It had a nice wasabi bite to it and was just wonderful. 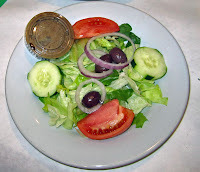 It's one of the best salad dressing's I've ever had. Overall, it was a nice meal. As I mentioned, our service was a bit unattentive. It was the middle of the afternoon and some of the wait staff, our waitress included, were doing some cleaning and other housekeeping activities such as changing out the ice tea station. That's what kept here occupied. One thing I did notice is that there really didn't appear to be any sort of manager or anyone in charge, and I think the service suffered for that. There seemed to be no direction in the front of the house, just people doing whatever they normally do. No on really keeping tabs on the diners and the dining room. Nonetheless, it was an OK experience here and I'd come back again another time. 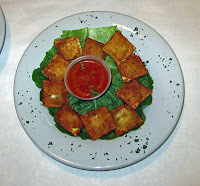 We went to Cozee Cafe in Lake Mary on a recent Thursday evening and had a nice meal. Mitchell provided us with very good service. It was a nice November evening and we sat outside. We decided to start with an appetizer, the Queso Dip. It was just passable and really could have used a bit of zing. 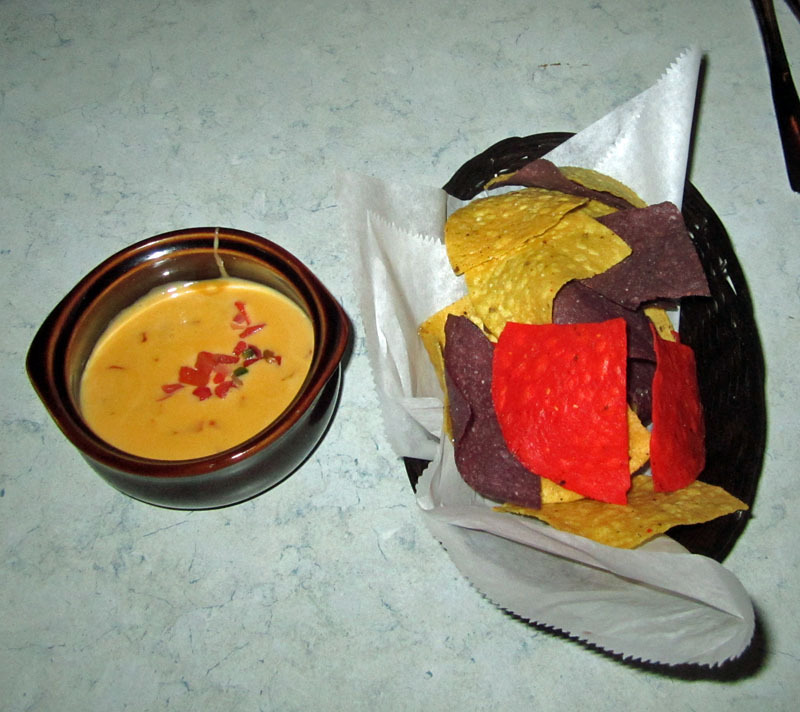 It was more like melted velveeta with a few bits of peppers added. It wasn't bad, just wasn't really what I'd call restaurant quality. Fortunately, the rest of the meal was better. 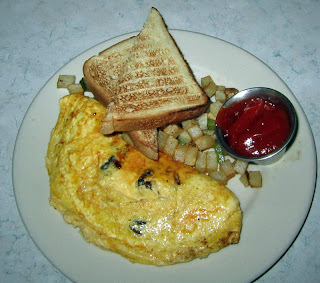 For his dinner, my friend Tommy had an Omelet with mushrooms and cheese. It was served with fried potatoes and toast. It was pretty good. He mentioned that the mushrooms seemed like maybe they'd been pickled, though they weren't bad, but probably had been cooked ahead and then held. Too bad, had they been cooked fresh, it would have much better. 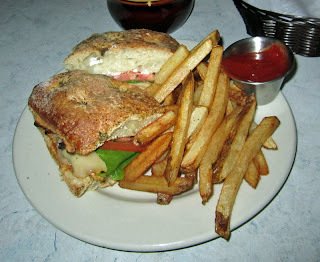 For my dinner, I had the special, a Blackened Chicken Sandwich. The chicken breast was tender and juicy and lightly blackened. 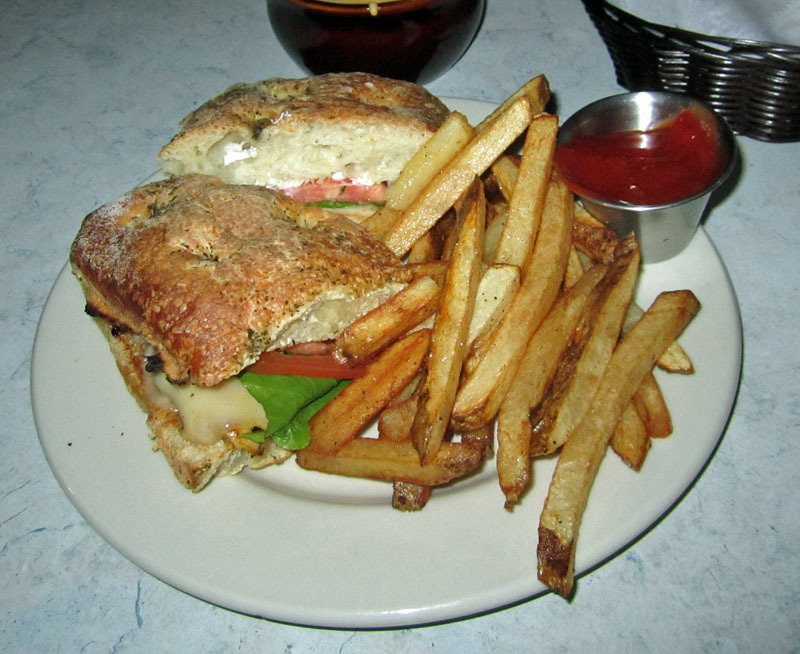 It was served with cheese, tomato, onion, and lettuce, on a nice ciabatta roll. It was actually a very good sandwich and I enjoyed it a lot. It was werved with fries which I thought could have been cooked an additional 30 seconds or so, they were not quite crispy on the outside and just cooked inside, but overall they were still plenty good. Overall, we enyojed our meal here and believe this newly expanded place has nice potential. A few rough edges and room for improvement, but they really tried to please us and took good care of us with fast, friendly, and efficient service. The outdoor dining on a beautiful evening was a great way to end an evening too. Nice job, overall.